We’ve teamed up with BetVictor’s Charlie McCann to preview the day’s racing. Both turf meetings were abandoned yesterday but news broke that Warren Greatrex’s Kauto Star Chase winner La Bague Au Roi would be travelling to Leopardstown next month for their 2m 5f Grade 1 Novice Chase. The mare was introduced into the betting for the contest at 2/1 with BetVictor behind Gordon Elliot’s Delta Work (11/8 with BetVictor) and I felt it was significant that the Lambourn handler hinted that the 2m 4f JLT – for which she is 8/1 at BetVictor – would be her Cheltenham target and not the RSA over an additional half-mile. No problems are expected at Gowran Park where Gold Cup favourite Presenting Percy (1.50) will make his belated seasonal reappearance. The selection won the corresponding race 12 months ago and remember he has not been injured this season – just waiting for the right conditions. There are showers forecast to fall on ground described as soft – yielding in places at noon on Wednesday. I feel Presenting Percy is the one to beat at Cheltenham in March and will be disappointed if he doesn’t run a big race back over timber even carrying 5lbs more than last year. The big betting race of the day is the Thyestes Chase a race Willie Mullins likes to target at his local track although he hasn’t saddled the winner since Djakadam back in 2015. BetVictor’s 6/1 market leader Invitation Only is a personal favourite, but I do remember him jumping out to the left – markedly at times - in the Champion Punchestown Novice when he was brought down two out by the fall of Monalee although the form book suggests he unseated his rider. He is reluctantly overlooked on this occasion, however, and my two against the field are the chase maiden Mall Dini (8/1 at BetVictor) and Sumos Nonios (3.00) who is the each-way recommendation at 25/1 with BetVictor who are paying 1/5th odds first five in the race. Mall Dini runs in the same colours as Presenting Percy, so it could be a good day for connections. I remember how well he travelled in the Kim Muir at last year’s Cheltenham Festival and leading amateur Patrick Mullins is again in the saddle. The vote, however, goes to Liam Burke’s 11-year-old who shaped promisingly over an inadequate trip on his reappearance and is a horse who I always thought had a big race in him. He was better than ever last season and showed he stays 3m when winning a Cork Grade 3 last term. The hope is that Wetherby beats the elements with no inspection planned at the time of writing. 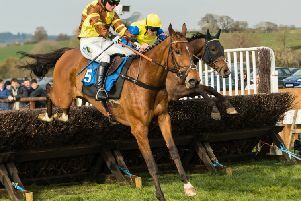 Follow The Swallow (1.35) bumped into the very well treated Mistress Massini at Ludlow last time and he certainly deserves to get his head in front, having fallen at the last when clear on his penultimate start. The selection has improved this term although it should be noted that his three runs have all been right-handed. The hope is that he can transfer his form to today’s left-handed track. Manwell (3.20) missed a winning opportunity yesterday following Catterick’s abandonment, but he is taken to gain quick recompense and land his hat-trick although this is a much stronger race despite only four going to post. Somewhere To Be was clear when coming down at the last at Leicester but the handicapper has had his say and he is 5lbs higher this afternoon. In the last, Coole Well is another who was due to run at Catterick and had been very well backed before we lost that meeting. The vote, however, goes to Captain Moirette (3.55) who ran a race full of promise returning from a 100-day lay-off over the minimum trip over Christmas. Today’s step up in trip should suit. Week four of the Meydan Carnival and there is a fantastic group 2 event on turf over nine furlongs. Blair House is the highest rated horse in the field and ran well in Australia without winning in some of their biggest races of the season at the back end of last year. Preference, however, is for Dream Castle (3.40) who looked a different proposition when scoring over C&D three weeks ago from a moderate draw. He has to show he can back up that effort, but it might be worth sharing that he covered more ground than any other horse in the field. He was drawn out in stall 11, and still won well last time. He has a good draw in stall three this afternoon. The sectional times suggested Top Score (4.50) chased too strong an early pace over C&D and he is taken to gain his revenge over Another Batt who ran him down late last time but is 5lbs worse off this afternoon. The form of Bint Battuta’s C&D win three weeks ago was given a boost when the second Ispolini won here last week, but he has been raised 4lbs for that effort and the likely market leader is overlooked. James Doyle would have the choice of rides of the Charlie Appleby runners and he chooses Spotify who is having his first start for the yard later today. I just feel his stablemate Dubhe (5.25) might be the value with Brett Doyle in the saddle. The selection has not seen the track since running out a decisive winner at Sandown over 10f on slow ground back in the spring and steps up to 12f for the first time today. Appleby’s charge has been gelded in the subsequent period and is out of an Irish Oaks winner, so stamina is unlikely to be an issue. For all your sporting odds go to www.betvictor.com or follow us on Twitter.